Damn it! I thought two or three times in recent weeks about writing a post predicting that the Supreme Court would vote 6-3 in favor of upholding Romneycare…uh, I mean the Affordable Care Act. So, you’ll just have to trust that I’m still able to tell which way the wind is blowing without tossing blades of grass in the air. But anyway, the law — along with affordable health insurance for millions of Americans — is saved because the Big Six saw the light. Now if we can just resurrect and pass the public option! We could then have a national health insurance program that could serve all Americans, and insurance companies would no longer be the big winners. You just have to wonder about (and I’m not going to say all) Republicans…Think about all of their wasted time, energy and money to undo this societal accomplishment. Had they spent these same amount of resources to improve the ACA, we would be much better off as country. People may disagree with the ACA proposition, but the American people are sick and tired of a small, well-financed, minority monopolizing our legislative agenda. Get on with things that need to be done, including making the reasonable modifications to ACA that need to be made. Antonin Scalia needs to retire from the bench. He’s an arrogant jerk and a clown and he doesn’t have the temperament for the office. Disagree with the majority opinion if you will, but carry yourself with the dignity Americans expect from a Supreme Court justice…Can’t FOX lure him away? By nature he is an angry right-wing talk show host, not a Justice. God bless Chief Justice John Roberts. He acts again with such decency to solidify our faith in the American justice system. The Affordable Care Act is not perfect. I have no respect for the Republican party because instead of offering ways to legitimately make it better, they just want to completely destroy it. Since the party would probably approve of corporal punishment, they should be spanked and sent to a corner until they learn to play respectfully with other’s building blocks. Justice Scalia is an opera lover. Surely he knows when the fat lady has sung. I don’t understand why the House of Representatives doesn’t just vote to repeal the law. What? They did? How many times? Really? Oh. OK. Sorry. I learned about the Supreme Court’s decision by checking The Star’s website, as I do frequently each day. Despite it being a landmark decision, however, the Obamacare story didn’t merit top-of-the-page treatment. 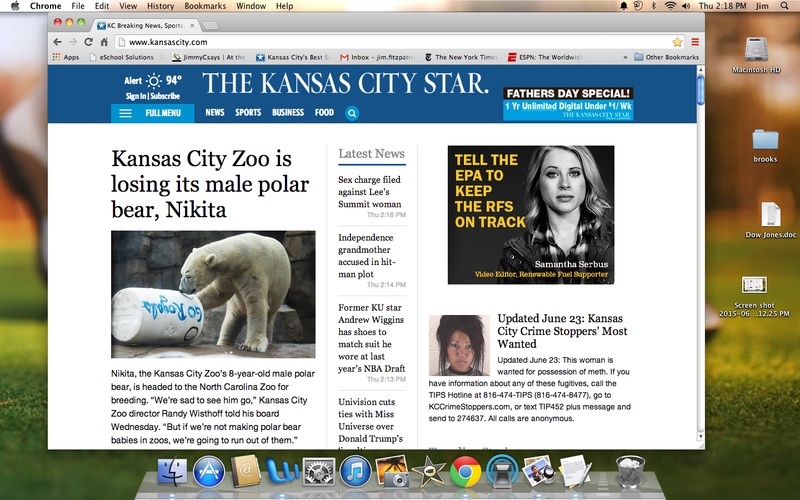 No, that honor went to a story about a polar bear named Nikita at the Kansas City Zoo. In addition, the McClatchy story that The Star ran about the court decision didn’t even have a breakdown on how the justices voted. 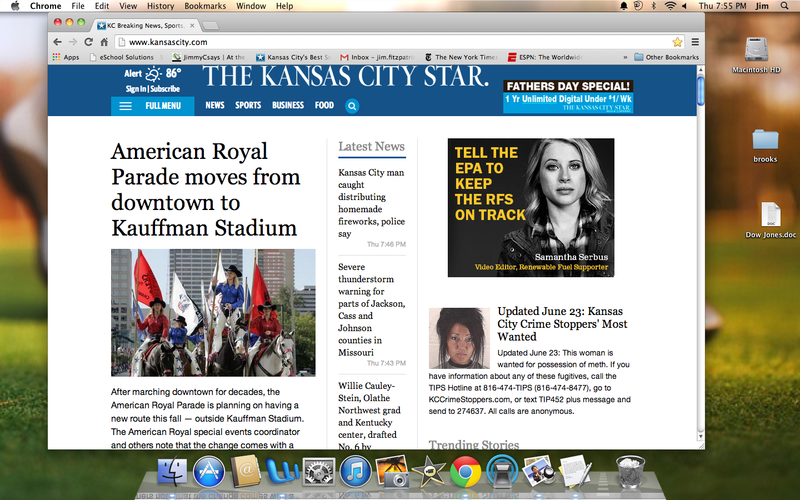 Later, the lead story was about the American Royal parade moving out of downtown. How is it that Scalia and Thomas are hacks, but Sotamayor, Kagan, Ginsburg and Breyer aren’t? Just curious. Personally, it seems to me that the rule of law is dead, tortured to death by ideologues who simply twist whatever comes before them into something they personally like. 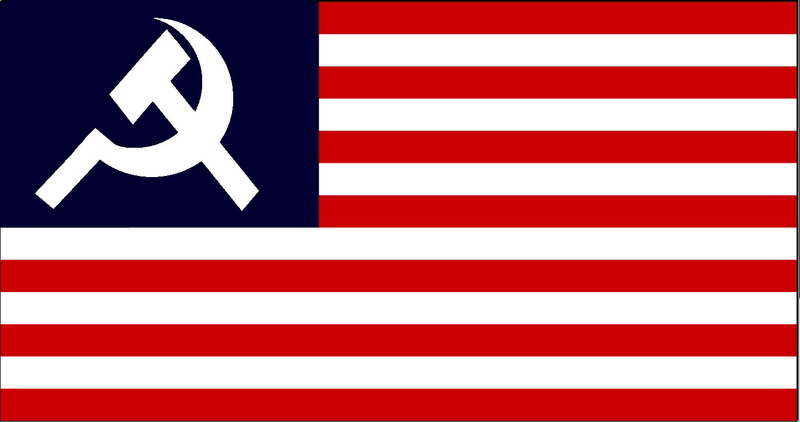 In essence, our republic is dead also, cause of death a design flaw that put a few tyrants from an occupation of whores as the final arbiter of what rules we’ll be forced to live with. It’s a great time to be old. Without the printed edition, how will the the owners of those little ankle biters potty train their dogs? Other than that, I don’t see any reason for them not to focus on their web edition. In their current economic state, it only makes sense to cut back spending on resources that people throw in the garbage. –Chief Justice John Roberts, in his dissent to the majority court ruling, complained that “five lawyers” — namely his colleagues on the highest bench in the land — had taken it upon themselves to redefine the institution of marriage as it had been accepted by multiple civilizations throughout history. Apparently no plaudits from your readers either. Is this the Jason Schneider show??? Good that I can give you a forum, buddy! I am just surprised that John and I are the only ones with anything to say about this. Commenting takes thought and effort, and I never take it for granted. Some posts get a lot and some very little, and it’s hard to predict what a particular post will yield…This one was all about comments when it was hatched, so it already fell in the category of general observation rather than provocative idea. I think people are just over this subject. I know I am. Where is Julius Karash when you really need him? And I am personally delighted that you have provided such a gracious forum for respectful dialog.